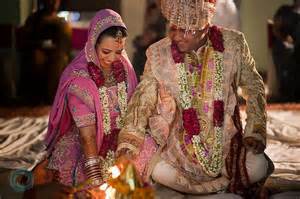 Wedding holds prominence in the life of every individual, especially if it’s a traditional Indian marriage. Indian weddings are unique and fun. Read on to know more. Traditional Indian marriages offer a power-packed entertainment. In the country, the preparations start long before the wedding date. The number guests in such weddings are usually between 500-1000 or even more. Additionally, the ceremonies are hallowed with a number of traditional rituals like pujas. Scrumptious food with vast variety, colorful dresses and glittering gold jewelries, lots of fun and numerous functions – the most prominent being sangeet and haldi. One can witness loads of variations in Indian marriages, considering the number of religion and community present in the country. However, the most basic ceremonies are more or less the same. Let’s take a look below to understand the different facets of this wedding. Pre-wedding functions – The pre-wedding rituals generally includes two most important and exciting events – Engagement and Mehendi/Sangeet. The engagement ceremony is the event where bride and groom exchange rings in the presence of their elder, relatives and friends. This is usually a small affair that includes limited guests. The occasion concludes with dinner, music and dance.Sangeet usually takes place a day before the marriage. It is also the day when henna (Mehendi) is applied on the bride’s hands and feet. In Maharashtra, this ceremony is known as Haldi, where the turmeric paste is applied to both bride and groom’s body. · Wedding Ceremony – The main and big day starts with the arrival of ‘Baraat’ which is a formal procession that includes people from the groom’s side. The event is celebrated with dance, music and enjoyment. On the entrance of the door, bride’s mother performs a ritual called ‘Aarti,’ where she rotates a plate consisting of rice, kumkum (tika), flowers and diya (candle) in front of the groom. Soon starts the Jaimala ceremony, where the bride and groom exchange garlands and commence the day. In front of a fire, the groom puts sindoor in the bride’s hair and exchange marriage vows, which is known as ‘saath vaachan’ – the 7 vows. Lavish dinner is arranged for guests to eat and enjoy. The final is the ‘Bidaai,’ where bride seeks blessings and bid adieus guests and her parents to start her new life. Post-wedding functions – The post-wedding ceremony includes a party at the groom’s house. The feast includes vegetarian and non-vegetarian cuisines that are generally homemade. Juta Churana (stealing groom’s shoes) – prank played by the bride’s sisters. Indian marriages are unique and exciting. If you want to attend and enjoy the traditional Indian wedding, book flights to India today. Details on cheap flights to India are available online. Car theft is something that every country experiences.